Home › Promotions › Spring Gift with Purchase - Have Cooler. Will Travel. Spring Gift with Purchase - Have Cooler. Will Travel. Harley-Davidson®'s FREE Gift with Purchase for spring is here! 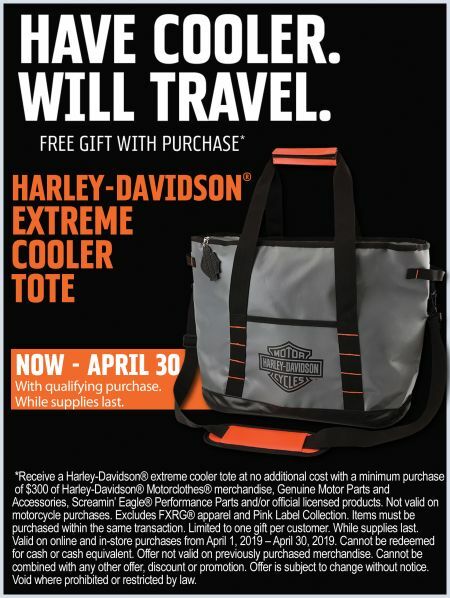 Receive a Harley-Davidson® extreme cooler tote at no additional cost with a minimum purchase of $300 of Harley-Davidson® Motorclothes® merchandise, Genuine Motor Parts and Accessories, Screamin’ Eagle® Performance Parts and/or official licensed products between April 1 and April 30th. Hurry, as the cooler is only available while supplies last!